Together with my children we became involved with a charity which ran a playbus. The original playbus was always involved in the town carnival celebrations It was an important date in our calendar. The children and families were invited to come along and join in the parade and come dressed in fancy dress costumes. It was always fun to be part of. Jay-Jay is a very special bus. He’s not a school bus or a city bus. He’s a playbus. All summer long, Jay-Jay visits different parts of the community so that the children can enjoy playing on him, in him, and around him. The end of summer is marked by a special carnival and a parade. Jay-Jay is the key attraction. But on his way to this year’s carnival parade, Jay-Jay has some engine problems and his driver has to pull off the road when he stalls. Will Jay-Jay make it to the parade on time? And who is this smartly dressed man who stops to help? 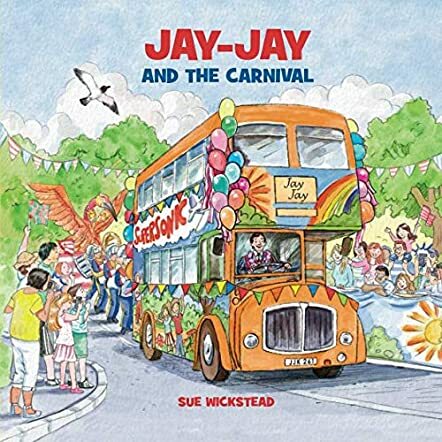 Teacher and author, Sue Wickstead has written several books on the Jay-Jay theme. Her stories are based on the real playbus, Bewbush Playbus, which is a regular feature in the annual Crawley carnival parade. Families work together to create a special bus to demonstrate the annual theme. In her picture book story, Jay-Jay and the Carnival, Jay-Jay is decorated and painted to feature the theme of flight. “Supersonic” was painted on Jay-Jay’s side, along with an airplane to make the playbus truly fit into the theme. This is a beautiful, fun little story with exciting and colorful illustrations. The fact that the story is based on a real playbus makes it all the more interesting. The story promotes the idea of play - real play, imaginary play - something sadly missing in today’s world. Children are encouraged to play on the playbus, to use their imaginations, and to create something truly fantastic. A simple story, packed with good, positive vibes.